MV Fame yesterday behind Harvest Caroline II. Norwegian-registered MV Fame was heading from Mallaig for fish farms in Harris and Lewis with holds full of salmon feed pellets when it grounded in East Loch Tarbert in the early hours of Sunday morning. The alarm was raised and tug MV Orcadia left its berth on the nearby island of Scalpay to go to MV Fame’s assistance. The Stornoway lifeboat was also launched. 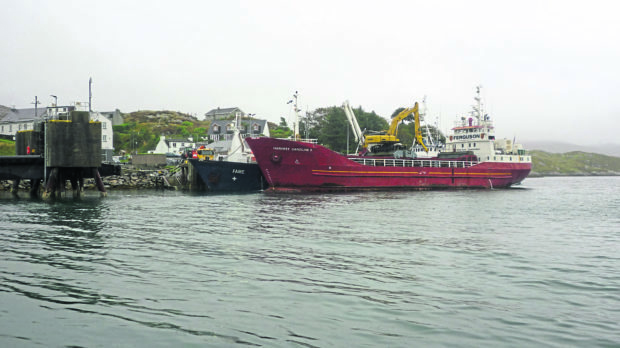 The stricken vessel managed to float free from the rocks, and although taking in water, made it to the harbour in Tarbert, with MV Orcadia staying alongside to assist. The Maritime and Coastguard Agency (MCA) asked Calmac ferry MV Hebrides to leave port to allow Fame to berth, and the ferry has since been unable to dock in Tarbert. 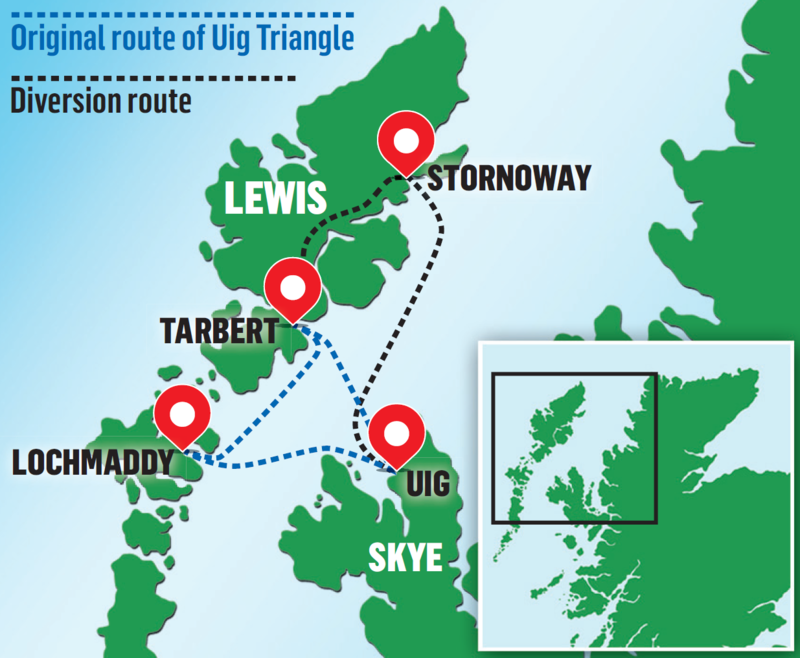 CalMac has been applying amended timetables to its Uig-Tarbert-Lochmaddy triangle route, missing out Tarbert and taking Harris passengers to Stornoway instead. This can involve up to three hours delay for passengers travelling to Lochmaddy from Uig. A Calmac said the delays were expected to last at least through Wednesday and amended timetables were being put in place. Isle MP Angus MacNeil said: “The boat should have been towed to Scalpay. This is the pier for a lifeline ferry and at the bare minimum she should be towed out and back in to make way for the ferry. “We can’t be using our commercial arteries for situations like this. At this time of year, 90-car MV Hebrides is still packed to capacity with visitors to the islands. A spokeswoman from MCA said: “As a result of the grounding on Sunday, MV Fame sustained damage to her hull. “Until the extent of this damage has been fully assessed and the current seaworthiness of vessel established, the MCA cannot allow the vessel to be moved from her current berth. It’s not the first time MV Fame has got into difficulties in Hebridean waters. The ship lost power following an engine failure in stormy conditions off Taransay in the Western Isles in December last year. Sailing conditions were particularly treacherous with gale-force winds and swells of up to eight metres. Fortunately, the ship drifted clear of the rocks, and did not ground. The Emergency Towing Vessel (ETV), Ievoli Black, arrived some 16 hours later and towed Fame to safety. During the day, cargo ship Harvest Caroline II came alongside MV Fame to take on board some of the stricken vessel’s fish farm feed and deliver it onwards to waiting customers.